Cambodian civil society expressed shock on Sunday at the shooting death of an activist and critic of Prime Minister Hun Sen’s government, a killing that came amid months of political tensions as the country faces elections next year. Kem Ley, 46, researcher and leader of the advocacy group Khmer for Khmer was shot two times in a store at a gas station in the capital Phnom Penh. The ministry of interior said he was shot dead at 8:50 a.m. Sunday local time. Phnom Penh Police Commissioner Chuoun Sovann told a news conference that authorities arrested a suspect near a Buddhist temple in the capital's Tonle Bassac precinct. The man, whose name was not disclosed, fled the scene of the shooting carrying a gun, he said. "We examined what happened at the crime scene, and after conducting a forensic examination of the evidence confiscated from the suspect, confirmed that the suspect is a murderer who killed Mr. Kem Ley,” said Chuon Savann. 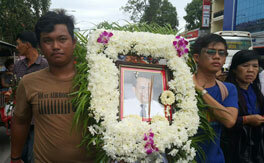 Hun Sen took to social media to condemn the slaying and order an investigation. "I pay my condolences over the death of Kem Ley, who was shot by a gunman," Hun Sen said on his Facebook page. "I condemn this brutal act. “We lost a good human being who has participated in social and political activities to push Cambodia to move forward,” he told RFA’s Khmer Service. An official of the domestic human rights group LICADHO, Am Sam Ath, told RFA that his and other watchdog groups demand that the government handle the investigation carefully. “We of civil society insist that authorities investigate the motive of this shooting death properly to dispel suspicion that the killing of Kem Ley is political,” he said. The executive director of the Cambodian Commission on Human Rights, Chak Sopheap, called on civil society to step up activism and not be cowed by the killing of Kem Ley. Political tension between long-ruling strongman Hun Sen’s Cambodian People’s Party and the opposition Cambodia National Rescue Party (CNRP) has been intensifying this year as the parties prepare to contest local elections in 2017 and a general election in 2018. Reuters quoted Kem Ley's pregnant wife, Pou Rachana, as saying “I don't know what happened. Somebody just called me and said that he's been shot." 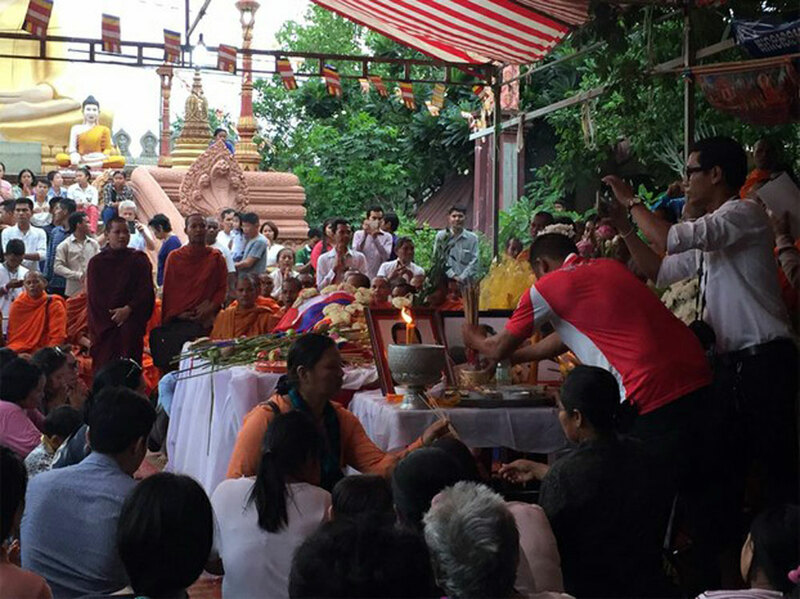 Thousands of supporters followed a procession taking Kem Ley’s body to a Buddhist pagoda in Phnom Penh, where his coffin was covered with flowers and fruit. University student Kem Kim from Kampong Cham province told RFA he did not accept the police account of the killing. “I want to find justice for him and find the real murderer. I do not believe that he owed other people money. I don’t believe it,” he said as he fought back tears. A widely quoted analyst, Kem Ley had appeared on a RFA Khmer Service call-in show to discuss a report by the London-based NGO Global Witness documenting how Hun Sen and his family have amassed a $200 million fortune. The Hun family has dismissed the report. Reported by RFA’s Khmer Service. Translated by Yanny Hin. Written in English by Paul Eckert. 0) the killing of Dr. Kem Ley is more cruel than Khmer Rouge. Khmer Rouge never kill anyone in the public place as they kill Dr. Kem Ley. 1) The killers and the conspirators are being frighten for seeing so many people come to show respect to Dr. Kem Ley. They are so scared of walking freely in Phnom Penh now. They told their children to jail themselves inside the houses or walk as prisoners with armed forces to protect them if they cannot avoid to go out of home. 2) the killers and conspirators are so shameful because people respect Dr. Kem Ley as a hero and great scholar, while wishing them to go to evil. 3) the killers and the conspirators are not intellectual as Dr. Kem Ley. They killed Dr. Kem Ley because they have no good justification to show the Cambodians that they are good, because they had been violent and cruel people. 4) It is a national threat to shut up the critics and scholar's ideas. 5) thousands more scholars will come up to continue Dr. Kem Ley legacy and initiatives. I had been so neutral person, but now became one of Dr. Kem Ley's followers and will do what I could to bring change and social justice to this lovely mother land. 6) The is the last resort of the losers. They will lost from now and forever and will suffer as much as all the combination of the suffering of Dr. Kem Ley's, Chea Vichea's, Chhut Vuthy's, and all other victims. Everyone know Hun Sen ordered for his assassin. It's time to bring Hun Sen for ICJ trial. FAKE condolences!! NEVER ever trust this thug! Listen to his tone and his words in the past few weeks and months. Do you think he feels sorry for what happened? Do be fooled. He has been fooling people for decades. This is what he is good at, killing and fooling people. Killing Chea Vichea and Chut Vuthy, and now Kem Ley. He has blood on his hand. "We are poor individuals with no power, but together on election days, we will bring down this murderous corrupt government."